Extreme weather has forced the British government into a U-turn, reversing spending cuts on flood defences. If the climate worsens, there will be difficult choices. But as yet the damage is relatively small. The UK is a long way from the expensive cleanups of Hurricane Katrina. 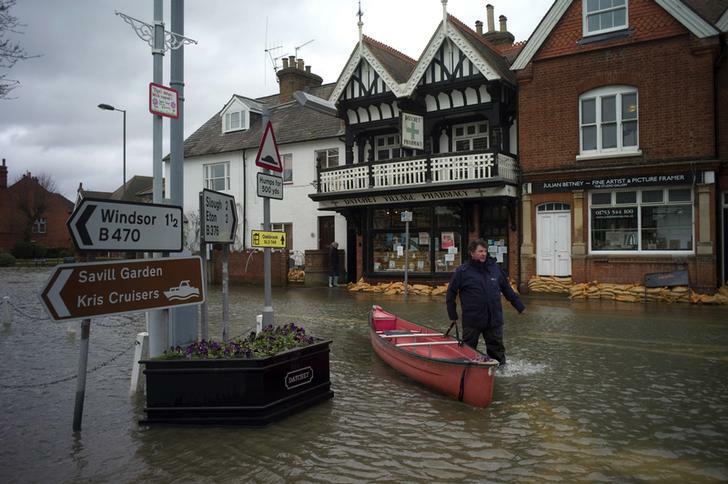 A man pushes his boat through the flooded central square in the village of Datchet in Berkshire, southern England. David Cameron, the UK prime minister, said on Feb. 11 that “money was no object” in the relief effort after the UK was struck by a prolonged period of storms and heavy rain, flooding part of the Somerset Levels. Eric Pickles, the government’s communities minister, said on Feb. 9, that the government regretted taking the Environment Agency’s advice. “We thought we were dealing with experts,” he said. Nicholas Stern, the author of a 2006 report on the economics of climate change, said the floods and storms are clear indications of the dangers of climate change.